I’m sitting having a cuppa and reading the small print on one of the free Chiltern Rail Weekend tickets we were given as a reward for being on the first Oxford to Marylebone train as reported in ‘Two go by train - Celebrating the new Oxford to London Line’ when the words ‘Expires on’ caught me eye. Cripes, indeed, it was nearly expired! We only had a couple of weekends to use them. Quick check showed the first option promised most of the service replaced by buses in the name of engineering works, not what I had in mind, but the second Sunday looked more promising. Urgent phone call. “Barry, what you doing next Sunday week?” “Off to visit the old boy at Uni.” I explained our predicament but sadly nowt’ could be done as arrangements had been made. Barry then very kindly offered his ticket up so that it wouldn’t be wasted. All I had to do was find someone that fancied a day on a train. Fortunately I knew just the person and it would have to involve a trip up the pub to find him. Tony the Tunnel Rat is a retired Underground Train driver, and always off on trips with a group of his mates. Couple of ESBs later and a plan was hatched, or rather the responsibility of co-ordinating train times and the like put in his lap, all I requested was that it would be good fun to end up at Little Kimble station but appreciated that may be tricky. I’m now standing on the down platform at Wendover. Its rudely early, sunny with a slight chill in the air, birds singing in the treetops and I’m enjoying a cup of coffee from Little Italy. Actually it’s a bit grey and overcast and Little Italy don’t do Sundays but one can always dress dullness up in your head! 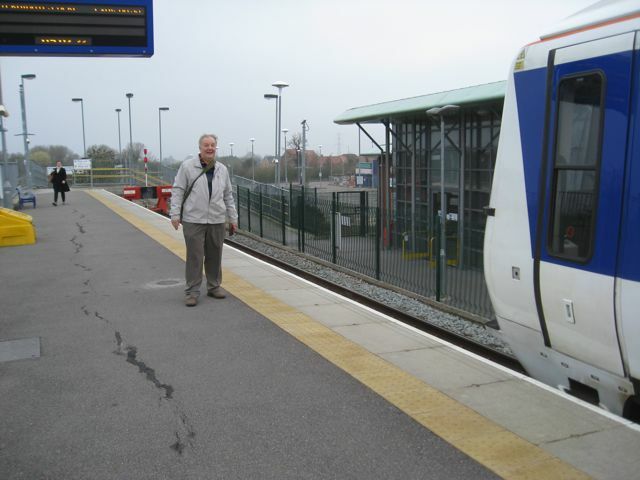 Tony planned to join the train at Stoke Mandeville but then over the bridge comes the man himself! “Thought I best do the whole trip,” he smiled. That’s the introductions over. Best be prepared because from now on this is where it might get a bit saddo. Our first train of the day rolled into the platform spot on time. A two-car Class 165. Perkins-powered, these busy, jolly fellows date from the early nineties and will do 90! Off we hurried, first stop Stoke Mandeville. We waved to Tone’s house, then Aylesbury Station itself and out onto the new Aylesbury Parkway extension which opened in 2008 and is actually a siding off of the old Great Central Line, used these days by rubbish trains running from London to Calvert. Next stop would once have been Quainton now home of the Quainton Railway Society but at the moment this is as far as you can go on the old GCR but plans are afoot to re-open the line to link Aylesbury to Milton Keynes and Oxford. Beeching eat your hat. We jumped off, took the mandatory piccies, jotted down the set number (165029) and ten minutes later were off back the other way, on the ‘up’ as they say, heading for Marylebone, just over an hour away. It’s a great trip, passing through the Chilterns the line becomes urbanised gently as it nears London. Although the Underground joins the fray at Amersham it isn’t until you approach Harrow-on-the Hill that London really starts to show. After Wendover our pocket rocket stopped at Missenden, Amersham, your actual Chalfont and Latimer, where the line to Chesham branches off, Chorleywood, Ricky, where Tony was rostered, past the big forebiding sub-station at the junction to Watford where my grandfather terrified me with the mercury-arc rectifiers, through Moor Park, a private station paid for by the residents of the estate, past Neasden Depot and onto Harrow-on-the-Hill, a station that just says ‘you are now entering Metropolis’. Indeed as you pull out there are six tracks in places with Metroland proper stretching away all around and a variety of Underground trains busying hither and thither. Houses crammed together in waves. The old Great Central Railway has its own lines here and now hurries behind the London Transport stations and tracks and is eventually swallowed by a tunnel at the back of Finchley Road station. You need to keep a watch out but suddenly you are in daylight again and going over the dismal, still open, remains of South Hampstead station with the dark tunnel mouths of the line from Euston below you, then you plunge back in the darkness and under Lords Cricket Ground. A momentary wait in the twilight whilst a train clears our allocated platform and we pop out the tunnel, cross the Grand Union Canal and slip into Marylebone. 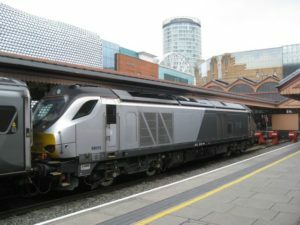 Imagine our joy as on the adjacent platform is the train waiting to hurry us north to Birmingham Moor Street and, as promised, it is a grand all-silver proper express train with a very big engine on the front. The engine is quiet and cold, for we have a 40 minute wait, so we head off for a coffee. We are very fortunate in having the Marylebone line. 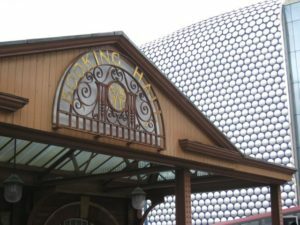 Until the eighties the Great Central Hotel opposite was the headquarters of British Rail and whilst the rest of the country would get closed down by rail strikes, the Chiltern Line would remain open as most of the BR staff lived down the track! 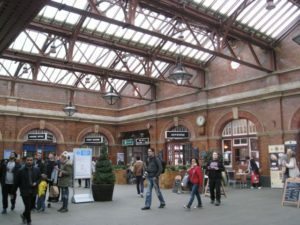 There was, until very recently, a fantastical magical flower stand near the carriage (as in horse-drawn) entrance that filled the place with scent, this, combined with hanging baskets, a glorious glass roof and birdsong in the bright concourse it was said that it ‘was a little bit of the countryside in London’. It is true that as you walk into it from the busy street outside full of taxis, buses and the noise of London, it is strangely peaceful in a nice way and you can often hear the chirrup of sparrows. The destination board now shows we have ten minutes so off we trot. This train is the same type Barry and I travelled on back to Bicester Village, or as some would insist, what should have remained as 'Bicester Town', in December 2016 where Little Italy was open and we did have a coffee albeit in fog. It’s a proper diesel engine, a mighty Spanish-built Class 68 hauling proper Mark 3 coaches and fitted with a Driving Van Trailer (DVT to the purist) so it can be driven from either end. All in Chiltern Mainline silver livery these trains hark back to the days of proper express services. Marvellous. Now you may think that going on about coaches is all baloney but compare these to the vast majority of sterile long-distance trains and you’ll soon get the idea. The seats are big and comfy the carriages quiet, bright and airy. There is even a buffet car. Old stock they may be but they are still the best on the system. They are the same as the ones that make up the old HS125 sets. 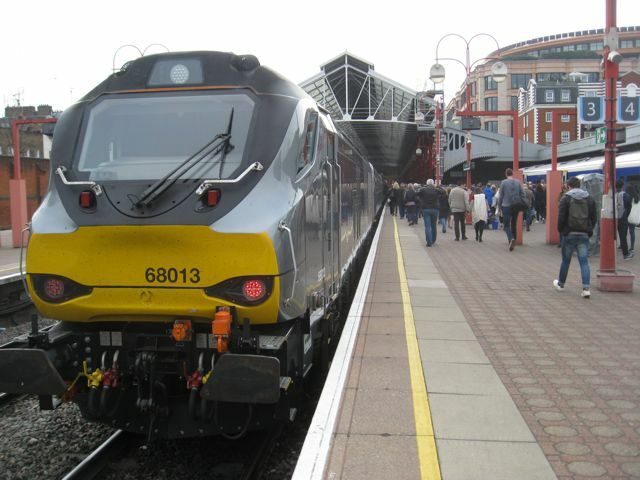 Chiltern Railways ones have been rebuilt to a high standard. Clam doors now replace the old slam doors and three pin plugs replace ashtrays. Wi-fi is everywhere, so I’m told. We went up front, behind the engine which was now sounding rather good, its V16 Caterpillar engine capable of toshing out 3,800hp, burbling away purposefully. 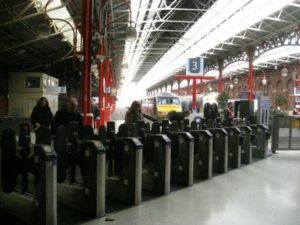 We left Marylebone the same way we came in and were soon running smoothly towards Neasden Junction where we ran over the points without noticing them, leaving the Aylesbury Line we had come up, and headed out past Wembley Stadium then north through High Wycombe, Banbury and onto Birmingham. 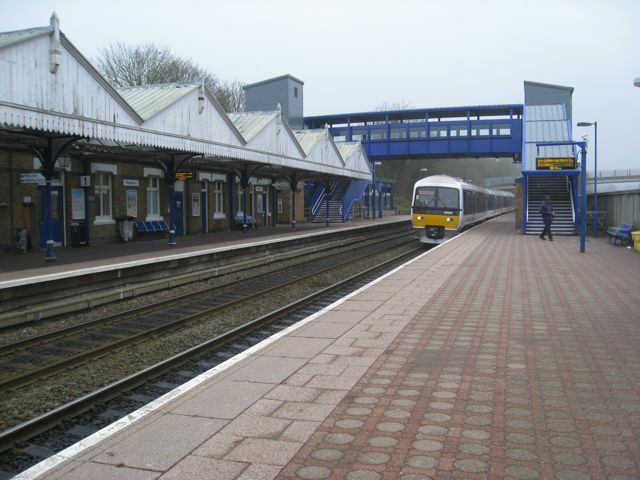 A lot of the line has been upgraded to 100 mph and the old station through lines, although now single, have been re-instated, meaning you hurtle through the middle of some of the stations between the slow lines whilst a local train sits patiently at a platform stopped by a red light. We cleared London before we’d realised it and were now fairly galloping away. I missed Beaconsfield, nearly spotted High Wycombe but caught Princes Risborough and spotted a couple of spotters which was nice. I gave them a wave but by then we were powering through Haddenham Parkway, no time to grab a coffee from that Little Italy then. The countryside flashed by while Tony tried to work out a way we could find some extra time to get to Little Kimble! The lines we were now running on have a really complicated history. 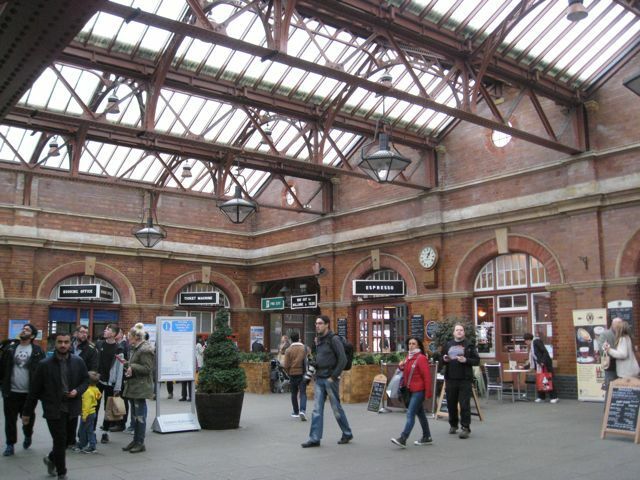 The original line was basically broad gauge Great Western running out of Paddington and ending up as the Great Central and Great Western Joint Railway when the Marylebone line was built before becoming part of British Railways Western Region and then something else, anyway, the architecture of the stations matches the development. Now we were slowing, approaching Aynho Junction outside Banbury station, surely the scruffiest edifice on the line. Rebuilt in the late fifties it is a monument to pre-sixties concrete modernism. Enough said but as Banbury is the home of Chiltern Railways Customer Services a coat of paint might be nice. Could do better we agreed. Leamington Spa, with a name board that fails to mention it is actually Royal Leamington Spa, is a much better example having been rebuilt much as it originally was, well the façade at least. No stopping at Warwick as they now have a Parkway. This is a bleak railing-clad place. Functional, I expect is the term. The M42 sort of acts as the gateway to Birmingham, a sort of defensive modern earthwork protecting it from the south much like the M25 is a moat round London. As we crossed it we were on the home straight. Solihull came and went, a funny single island station that is undergoing work then suddenly there were old factories and the dirty mess and untidy clutter that is the outskirts of Birmingham, something you only really see from a train. Birmingham Moor Street though is a revelation. I’d never been to Moor Street and was enchanted. It is truly a seaside station or rather ought to be. Walk out the front and there ought to be sea. I grant you that there is a building built out of silver pebbles so fair enough I suppose. Pure Great Western, it nestles in the shadows of the Bull Ring. It is a gem. If you’d told me it was a preserved railway I wouldn’t have batted an eyelid. 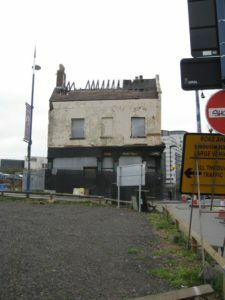 The only give-away were the through lines to Snow Hill which re-opened in the eighties. Moor Street, as a terminus, is very lucky to have survived but survive it did, thanks to enthusiasts as it happens, and very lovely it is. There are big plans to spend a lot more money on it and open up the unused tracks. 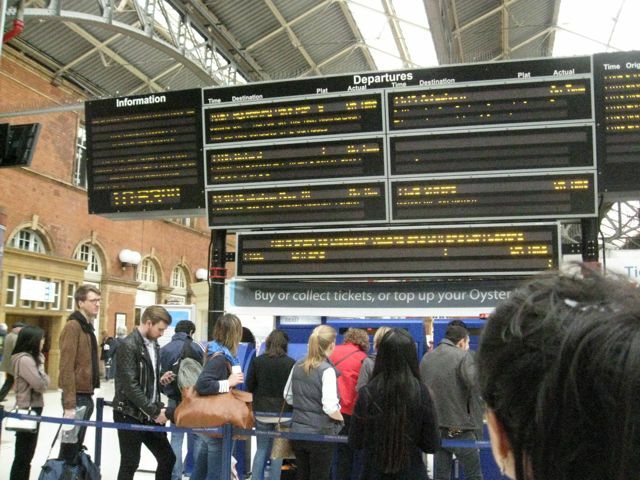 Marylebone to Moor Street on an Express isn’t much over an hour and a half. Our driver parked the train, the passengers disembarked and we went in search of some grub. Now, all lovely the station may be, but take a few steps outside back down the line and the area is seriously neglected. 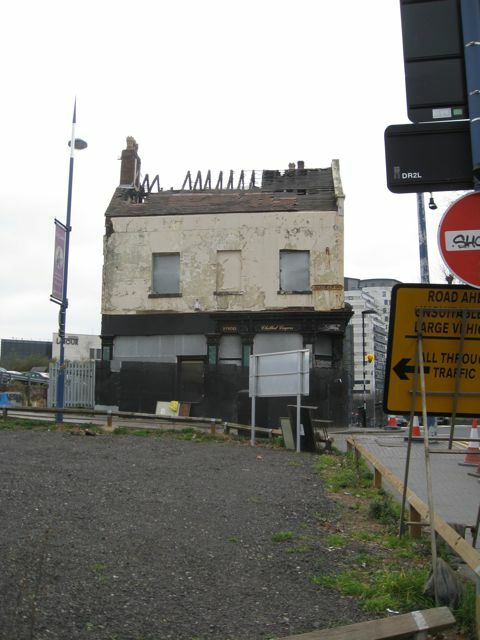 We spotted a burnt out pub, tattoo parlours, several dubious night club looking places, along with an uninviting row of semi-derelict furniture showrooms. Presumably this will be the area that will be flattened to accommodate the HS2 terminus? 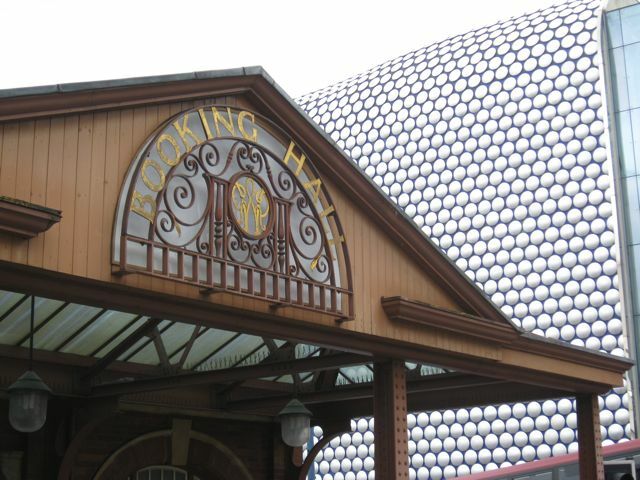 As for the station itself the lovely front entrance has been restored and still sports the British Rail logo. Nice touch. Back in the safety of the concourse we found a delightful Tea Room and enjoyed some masterly soup and a roll along with a fine cuppa. Then it was time to go. To say our train, and it was now ‘our’ train, was parked whilst we had some grub, was quite an understatement. There were very few passengers joining us but it gave us a chance to talk to some of the staff. They loved the train and explained that during the week, and on the later train, it would be packed. 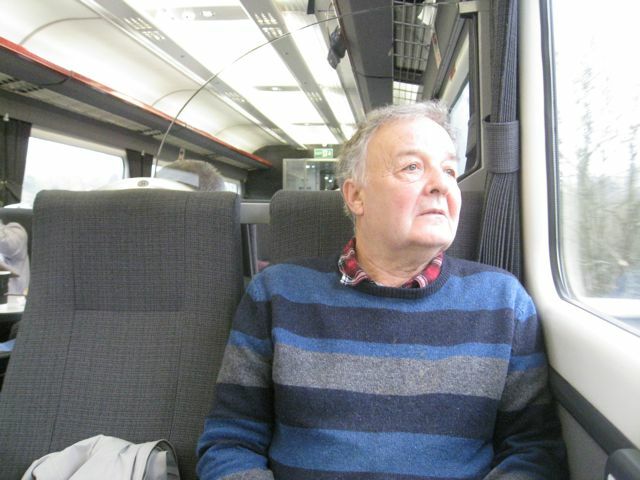 By now Tone had worked out that if we cheated a bit and hopped off the Silver Train at Banbury and didn’t get mugged or graffitied we could scramble on a train to Oxford and comeback to Marylebone on a Chiltern Flyer. 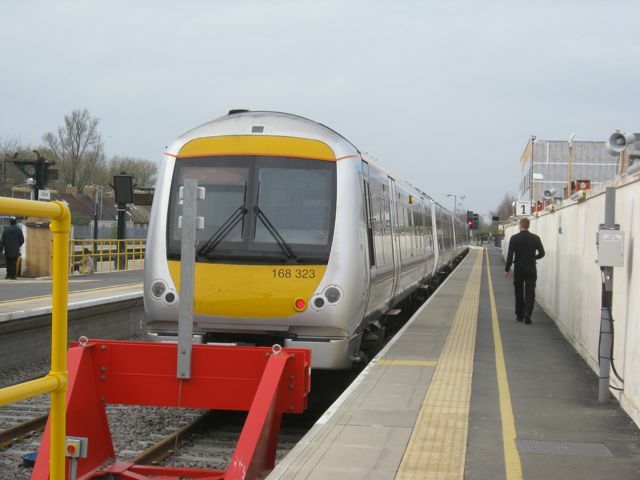 The Sunday service didn’t allow time to divert, or find a suitable train, that would connect with an Aylesbury train at Risboro’ and take us to Little Kimble without missing the chance to see the new Oxford link in daylight. So that’s what we decided on and after a most relaxed hurtle down the line we waved goodbye to our Express at Banbury, kept our heads down and sneaked aboard a CrossCountry train heading for Oxford. The difference couldn’t have been clearer. It’s the windows in the Mark 3 carriages that define it. The seating is aligned with them. On this Class 220 thing, the seats had been shoe-horned in where they fitted and had it been dark you could have been on an Airbus heading for Malaga and there wasn't a spare seat to be had. I think it had come from Newcastle. 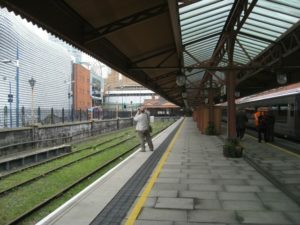 Oxford Station is a sadly dishevelled grubby station but it has new platforms for the Chiltern trains and is an old station so has soul. 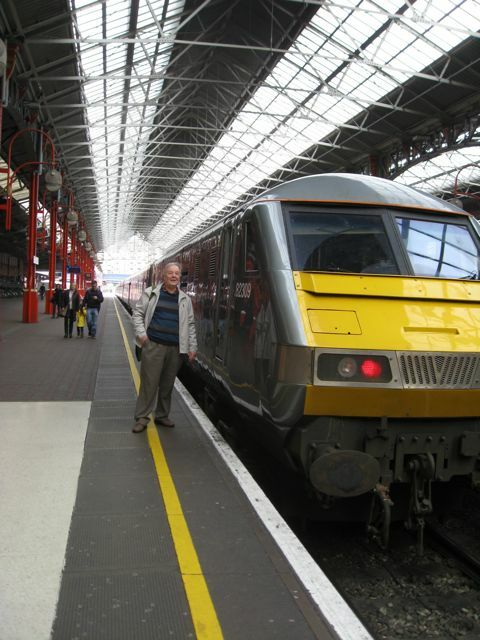 Our train was a rather nice Class 168 (Clubman), clean and tidy and under subscribed. Without any fuss or bother and bang on the nose we drew out and headed for Oxford Parkway. A few people got off and less on. Next up was Bicester Village where there was an announcement going on in Japanese and lo and behold a squadron or two clambered, parcel laden, aboard. The buzzer sounded the doors clamped shut and we were off, non-stop to Marylebone, back the way we had come. Impressive we thought. We spent the time, well some of it, discussing that it was sad that trains were now given Classes and that those that did have names were pants. ‘Clubman’ indeed. There was a ‘Mini Clubman’. Gone the Moguls, Britannias, Black Fives and Bullied Pacific. Then there were the more descriptive names like West Country Class, Castles, Halls, saddle tanks and Prairies. Tony explained that many did have names like the CrossCountry thing which was a Voyager. Didn’t do it for me, like calling a caravan an Eldiss Buccaneer. Too broad, inappropriate. Mind you we were talking sets rather than locomotives and Chiltern Railways had their, very aptly named, ‘Bubblecars’. As we shot through Risboro’ the spotters had been replaced by a gaggle of hikers who waved pointlessly, simple mistake, we were long gone. I tried to take a picture of them but got a tree. Then it happened, just as we approached Neasden Junction we got a red. The driver came on the tannoy. “Apologies but we are being held on account of a Metropolitan Line train.”, clearly he didn’t speak Japanese and the Japanese started to get their designer bags and clutter together readying for the off and headed for the doors. If they could have got them open they would have been gone. They could have gone and had tour of the Neasden Mosque which is a thing of beauty I suppose. We exchanged glances. The Met doesn’t share the Chiltern running lines here. Wasn’t their fault. Tony checked the timetable consulted his watch and stated that, “We are early!” Had to chuckle. I hoped the driver would do a runner at Marylebone before Tone confronted the fellow. Blaming the Met indeed! 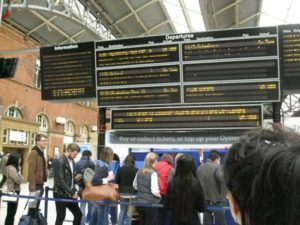 With the Japanese contigent now re-seated a few minutes later we were running into the platform at Marylebone. 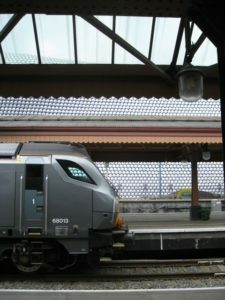 The Silver Surfer we had abandoned at Banbury was quietly resting in the next platform. Déjà vu and for a moment we were tempted but checking the board an Aylesbury train was due to depart anytime soon so off we trotted. Doors closed and most of the London suburbanites were aboard, goodness knows where they’d been. Quite a few jumped ship at Harrow-on-the-Hill. We nipped smartest under the M25 and freed ourselves of London and pulled into Chorleywood where a few got on but by Amersham it was locals only and we grabbed a seat. Over a celebratory pint of ESB or two in the Swan we decided we’d had truly fine day. I’d discovered that Tone has a model railway in his loft and learnt a lot about timetabling. Tone had learnt that it was very nice to be tipped the wink when you showed a presentation ticket as they don’t work in the automatic gates and got over the slur against his beloved Met. We’d done the whole length of the Aylesbury Marylebone Line. 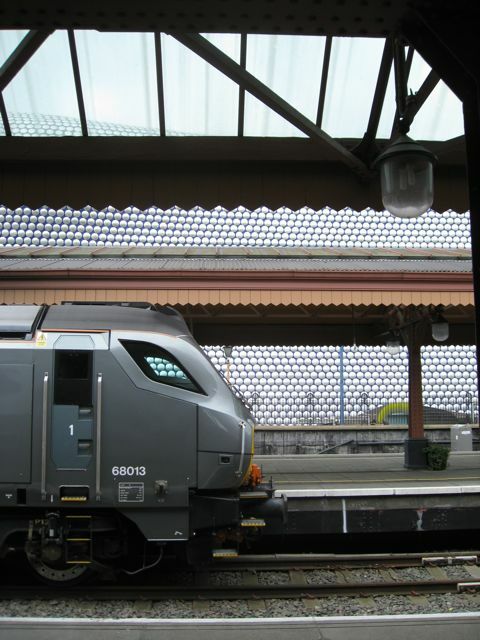 Enjoyed the luxury of the Silver Express to Moor Street and then back to Banbury like it was ours. Had an interlude and reality check as to what rail travel was really like on a characterless thing to Oxford from where we had been whisked pretty well non-stop to Marylebone by which time the day-trippers were heading back to the suburbs oblivious that they had a couple of adventurers amongst them. As for Chiltern Railways? Can’t fault them, mind you a silver service on the Silver Train might have been nice. Highlight for me was certainly Moor Street but that is the only place we actually really had any time at. 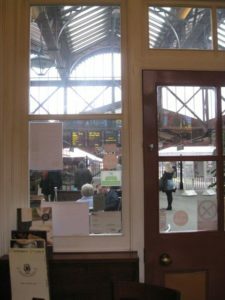 There is a splendid book called Parallel Lines by Ian Marchant which is pretty hilarious and in true Marchant-style I called Jane to let her know I was no longer on the train!